From New York City to Star Wars' Skellig Michael, enjoy an Oscar-winning break with Nicola Brady's round up of great movie locations. There seems to be an iconic landmark on every corner in New York (pictured above), whether it's the diner from Manhattan or a skyscraper from King Kong. This year, there's plenty of Oscar buzz around Birdman, the quirky movie starring Michael Keaton, which was shot largely in the St James Theater in Times Square. There's an incomparable sense of history to the quaint streets of Cambridge, one that is expressed beautifully in The Theory of Everything. The film tells the tale of Stephen Hawking and his wife, following the story of his illustrious career and the progression of his motor neurone disease. The city makes an attractive backdrop for the story, with scenes shot in and around the University of Cambridge, which operates regular campus tours. Wild tells the story of Cheryl Strayed, who walked more than a thousand miles of the epic Pacific Crest Trail to heal the wounds of her tumultuous past. The trail itself spans 2,650 miles between Mexico and Canada, with more than 450 of those passing through incredible Oregon scenery. The much-anticipated new Star Wars movie was shrouded in secrecy, as locals found out when production set up shop on Skellig Michael last summer. You can't stay on the UNESCO World Heritage Site itself, but you can get a boat out to explore its rugged charms. The season runs May to October. While the characters were far from charming, the Italian setting for The Talented Mr Ripley certainly was. The tale was set on the fictional isle of Mongibello and filmed on the pretty islands of Ischia and Procida. You can live out your own fantasy by slipping into a 1950s' bikini on one of Ischia's beaches, and singing Tu Vuò Fà l'Americano with a frosty beer come nightfall. It's far from a fairy tale (and not one to watch with your mother) but there's no denying the allure of rural Mexico in Y Tu Mamá También. In it, two teenage boys take a road trip to a mythical beach they've invented to impress an older woman. By chance, the trio eventually happen upon a deserted beach in Oaxaca, which fits the bill perfectly. When Tom Hanks washed upon the shore of a desert island in Cast Away, it was the start of an arduous four-year journey. While that torment mightn't be ideal, there's no denying that his island home was. The crew filmed on Monuriki, an uninhibited island that is part of the Mamanuca Islands. While you can't stay on the island itself, you can visit for a day and snorkel in the paradise waters. With its dramatic vistas, ethereal mountain ranges and grand glaciers, New Zealand is the perfect backdrop for a fantasy tale. Since 2001, it's played the role of Middle Earth, with hobbits even popping up in an epic inflight safety video for Air New Zealand. 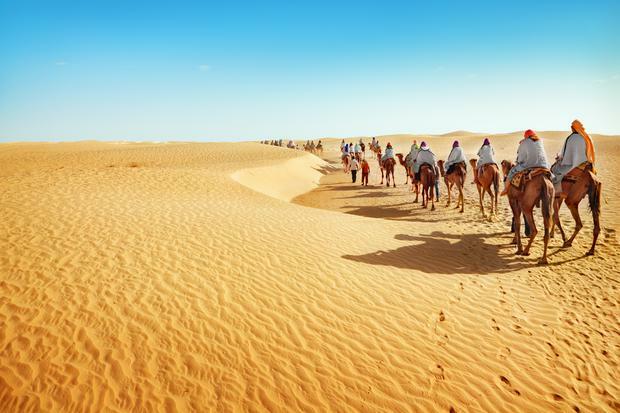 With its mythical, sweeping stretches of sand, Tunisia has long been the dream location for any films set in the desert. The city of Tunis played the role of 1940s' Cairo in The English Patient, with the desert shots being filmed near Nefta (also used in Star Wars: The Phantom Menace). UPDATE:A popular winter sun destination for years, travel to Tunisia was deemed unsafe following a terrorist attack in June 2015. Want to take the hassle out of location hunting? Book a tour with the experts. Based in New York and Boston, On Location Tours (onlocationtouts.com) offer itineraries focusing on specific shows or movies, or general site spotting. Perfect Paris: You can’t beat the City of Light Lights, Camera... Malta!